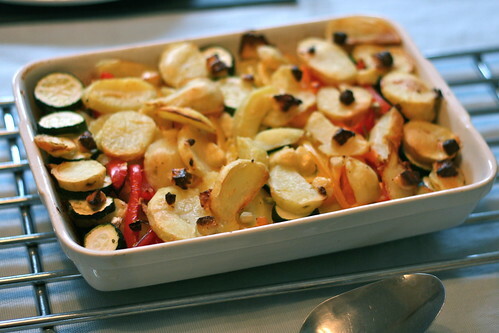 I know this uses summer vegetables, but it is proper cold-weather comfort food. Filling, warm, satisfying and lush, it was utterly perfect for the first really cold Sunday of the year. It uses those The Laughing Cow: Deli Light Blue Cheese squares to make it low fat, but I want to try this with proper blue cheese at some point because literally the only thing that could have made it better would have been lush, melted, gooey blue cheese in the middle. 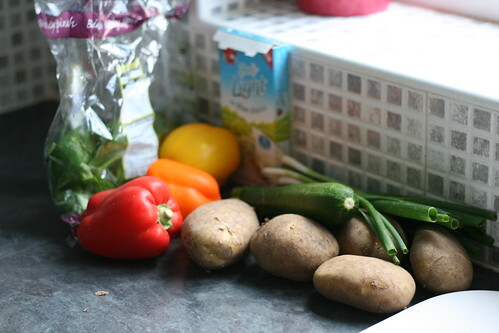 It’s vegetarian and works fine as a vegetarian dish. But I also cooked some lamb chops for my parents when I had it, and the lamb apparently went really well. So there’s a serving suggestion for you: lamb chops. Mmm. 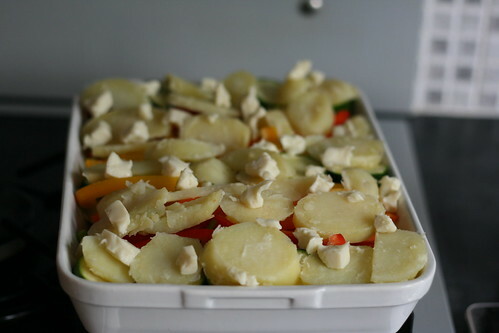 Pre-heat the oven to 200C and boil the potatoes for about 10 minutes before draining and slicing them. 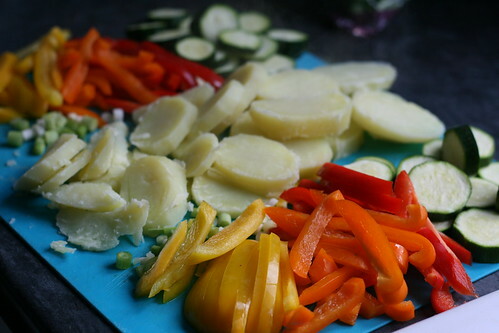 Whilst they’re boiling prepare the rest of the vegetables; deseed and slice the peppers, chop the spring onions and slice the courgettes. You’ll be glad to know that at this point, all of the hard work is done. 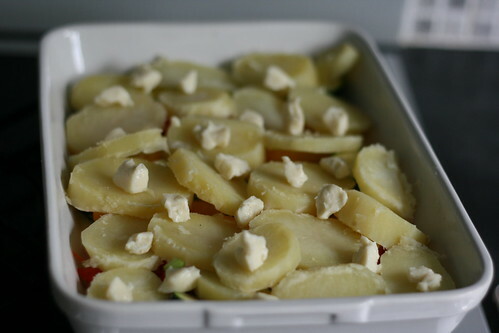 Then layer over half of the potato slices and scatter over half of the crumbled blue cheese. 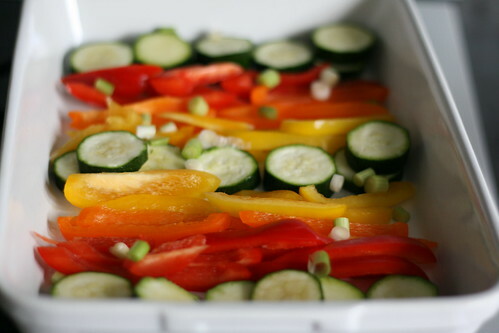 Repeat with the other half of your vegetables and cheese until the dish is full. Pour over the stock, then cover with foil and pop it in the oven for 45 minutes. Then just take the foil off, stick it back in for 15 minutes and then serve. Look at that. How lush does it look? Very, is the answer, and it tasted gorgeous too. A total winner and a definite make again.